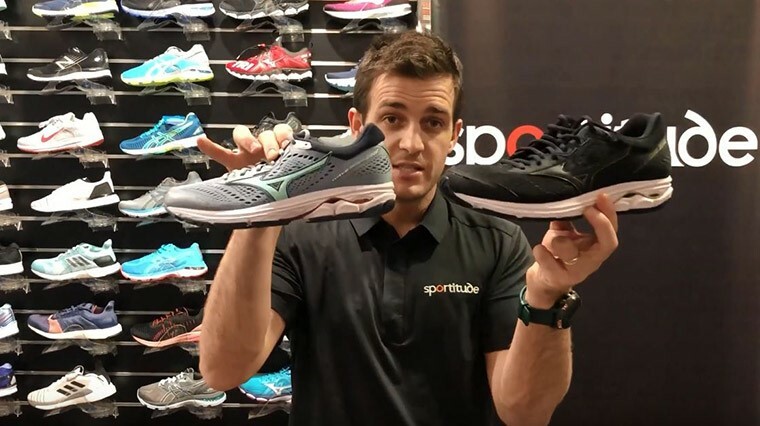 Josh reviews the Mizuno Wave Rider 22 running shoes and provides insight on the subtle tweaks that set it apart from its predecessor. This newest generation caters to neutral and supinated foot types and features minor adjustments to the upper and outsole, with the most notable change being its increased flexibility. 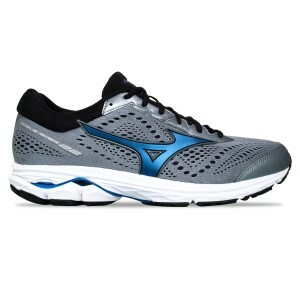 When it comes to the midsole Mizuno have stuck with what works, featuring the popular Wave Plate for structural integrity and a combination of U4icX and U4ic materials for responsive cushioning and shock absorption. Hi guys, Josh from Sportitude here today coming at you with a shoe review on the Mizuno Wave Rider 22. 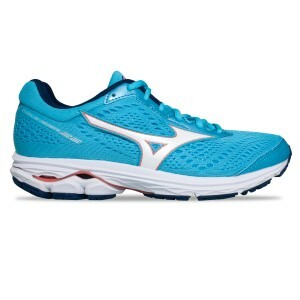 It’s a fantastic new shoe in the Mizuno range. Some features are slightly tweaked in this shoe from the Mizuno Wave Rider 21 which I’ll touch on in this review and compare it to the old model. We’ll see if it’s going to be one of your new shoes in your running closet. Without further ado we’ll get stuck in. We’ll start off with what foot type should be running in the Wave Rider 22. Looking at this shoe there is no medial assistance in the sense there is no arch support inside this shoe, so it’s not going to cater for an overpronated foot type. We’re looking at a neutral to a semi-supinated foot type. We’re talking about a foot type that has a high arch with quite a pitched navicular region. When you’re coming through your gait cycle, whether it be heel strike or mid strike, we’re not collapsing through that medial platform. We are staying quite high, quite pitched through that midstance phase and the pressure is on the outside of the foot. When we are coming through toe-off we’re more than likely going to be toeing off on that second, third, potentially fourth metatarsal as you go through your gait cycle. I’ll touch on the widths first up. In the ladies’ we’ve got the B width and then we have the slightly more generous D width, B being standard and D being a little bit wider. In the men’s we have a D which is standard, and we have a 2E which is slightly wider. The colour I have in my hand here, the black and gold from the men’s range only comes in a D width. For all the colour offerings and widths hit the product pages below and you’ll get a bit of an idea of what widths are available in what colours. Let’s talk about what’s different from this Rider 22 in comparison to the Rider 21 and the changes a little bit in the upper and the outsole. The midsole setup stays the same. I’ll flip it upside down and we’ll look at the outsole of the Rider 22. The biggest change in this shoe is the addition of an extra flex groove through the forefoot. We’ve got two and half flex grooves through that forefoot, but what we found in the 21 is it’s one and half flex grooves. We have one flex groove right the way through that forefoot then the half flex groove on the ball of the foot. As you can see from a comparison between the two of them if you put your thinking hats on, is that the Rider 22 is more flexible through the forefoot simply by having an extra flex groove. The 21 was a great shoe for a potentially slightly pronated foot type. Every now and then we find pronated foot types that don’t like running in supportive shoes and in some cases where we need a bit of guidance support and it still doesn’t work, we dropped down to a Rider or Ghost 11 etc. from another brand. Main reason being we’ve got a little rigidity under the ball of the foot so we’re getting a bit of protection under that first metatarsal when we’re toeing off. Not the case of the 22 anymore. Because it is so flexible in the forefoot I would not put anyone inside this shoe that is pronating even mildly through that midstance to toe-off phase because that extra flexibility is going to cause too much movement on that forefoot and open up some stress through that first metatarsal, second metatarsal etc. You don’t want to get too much overloading through that forefoot by having a shoe that’s too flexible and running in a shoe that’s not catered for that foot type. That’s probably why as a Mizuno runner you’d go “See you later Mizuno Rider 22” and “Hello Wave Inspire 14”. That’s the sense of the two shoes that cater to both foot types. As I said the outsole forefoot setup has changed slightly. Looking at the outsole through the contact zone underneath the heel, they have slightly tweaked that as well, almost adding a little flex groove. We’ve got two slits through the back half of the heel unit, it's great and nice and cushioned. They’ve increased the slits to four to provide a slightly, softer feel underneath that point of contact with the ground, especially if you’re a heel striker. Looking at the midsole setup, the famous Mizuno Wave plate they use in all their technical, high-end running shoes comes into play again. The Wave Plate is placed exactly in the same position as what it was in the 21. The Wave Plate finishes just after that breaking phase of the gait cycle. It’s nice and stable, providing plenty of rigidity through the back half of the shoe with contact of the ground holding that midsole nice and structured. Then from essentially this part of the shoe forward we’re talking all things flexibility in conjunction with that really flexible outsole setup. It’s a light, flexible shoe through toe-off. U4icX is the softer gradient of EVA which takes more impact on point of contact with the ground. Underneath the Wave Plate is the U4icX. They put that soft cushioning system closer to the ground to give it a bit more impact. On top of that the U4ic is slightly more responsive EVA to provide a little more support when your foot hits the ground and cradling it through from midstance to toe-off. That’s what Mizuno are trying to achieve with the layering of the two cushioning systems, split between that Wave Plate of course. The Wave Plate does a great job. It holds the midsole in good shape, keeps the shoe integrity holding up from the first K right to the last. That’s what the Wave Plate does, it keeps it nice and structured. When you’re looking at the differences between the 21 and the 22 it’s very minor. You can see the colour split between the blue and white midsole to identify the U4icX and U4ic cushioning systems. They’ve gone for the same colour in the 22 for a cosmetic change. However, the only real changes are the slits they’ve put in the EVA itself. Obviously, they’ve done their research and they’re wanting to provide as much cushioning response as possible. By creating a few different slits in specific areas of that midsole will hopefully have an end result of being a really efficient shoe for you at home. As I touched on earlier, there’s nothing that’s been thrown into that medial side to offer any support for an overpronated foot type. It’s all about a neutral to supinated foot type for this running shoe. I’ve been for one run in the Rider 22 and it was only a 5km jog to get a read on the feel of them. The biggest feature I’d found was all about the flexibility through the forefoot. That was the first thing I noticed from the first step as I went through to toe-off. There is a lot of flexibility through that region. I like the idea and where they’re going with the design of this engineering. However, for someone that requires a little more rigidity and support through that area, I probably wouldn’t look at the Rider 22. 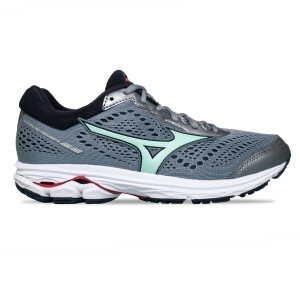 We’ve got your Wave Sky from Mizuno and obviously there’s some other competitors from other brands that you can certainly consider. Let’s talk all things upper. We’re talking a nice, deep heel counter setup. The great thing about Mizuno in the past and I’ve preached this over the last couple of years is the depth of the heel counter. The internals are nice and solid. When you put your foot in a Mizuno shoe you know it’s in it. It’s really deep with plenty of support to lock around the back of the calcaneus which is great. They obviously have the initial eyelet at the back so if you need a little bit more security around that ankle, you can just go back to that last eyelet to lock it right in. We’re talking a double layered mesh. What Mizuno are trying to achieve here is keeping plenty of structure and integrity in this upper. Remembering this shoe is designed for someone who is probably going to be hitting the ground with a fair bit of force. It’s almost a speed style shoe. Hitting the ground with that amount of force is going to create a little more velocity whether it be underpronation or overpronation, so it’s really important that the shoe in the upper holds you in a really good position. By doing that they stitched in the logo on the lateral and medial side so that gives it a little more structure and integrity. The double layered mesh comes to play right through the forefoot so when you’re toeing off it's nice, stable and strong yet really light and breathable. The double layered mesh gives plenty of strength but also opens up the air flow through that foot, so we don’t get the swelling and friction that we may get on longer runs. There we have it guys, the Mizuno Wave Rider 22. A great little update from Mizuno. Any questions at all please contact our Sportitude shoe experts. Anything running related on this product or if want some help selecting a new running shoe just drop a comment. If you haven’t subscribed to our YouTube channel please do and until next time, see you on the road.